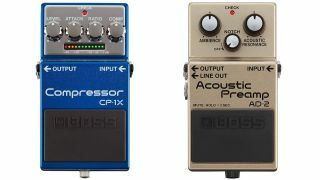 Boss has added a pair of tone-polishing pedals to its ever-expanding compact line-up: the CP-1X Compressor and AD-2 Acoustic Preamp. Utilising Boss's Multi-Dimensional Processing, the CP-1X offers multiband guitar compression with intelligent processing that promises advanced dynamic control. A nifty gain reduction indicator shows the current compression amount, adjusted via level, attack, ratio and comp controls, which also tweak multiple parameters under the hood for constant fine-tuning. The pedal's digital tech makes for low-noise compression, and its 18V input provides headroom for the hottest pickups - handy given it can handle any genre from country to extended-range prog, apparently. Promising "studio-quality sound while performing on any stage", the AD-2 offers acoustic-optimised reverb, resonance control for enhancing piezo pickups, plus a feedback-taming notch filter, balanced DI out and mute function for tuning or swapping guitars. Three knobs adjust these parameters - ambience, notch and acoustic resonance - while holding the pedal's footswitch for two seconds activates the mute function. Typically well-appointed additions to the market, these. The CP-1X lands at the end of December for £139, while the AD-2 is available from the tail-end of November for £109.